As soon as the cards became popular, the first producers realized it was a great way of making money and the competition for winning the customers began. Goodall & Sons was first started in the year 1820, when they started their business in Soho. The company began with manufacturing of playing cards and other types of message cards. The earliest cards manufactured by them were quite traditional in appearance and were often compared to those manufactured by Hunt. In the 1830s the company expanded its premises and the main factory had then been located in a building which had once been a factory manufacturing guns. It was around this time that Goodall started experimenting with new designs and patterns for a more modern approach to playing cards. Very soon, the cards that we all know today evolved. Charles Goodall’s two sons also joined the firm and to compare with La Rue, their main competitor, were producing more than two thirds of the playing cards that were sold in England at that time. Almost half a century later, Goodall’ firm was the leading producer in England selling more than 2 million packs a year. Goodall & Sons soon took over the Reynolds & Co, acquiring all their equipments and stock. Their designs were widely popular by then and were copied by several manufacturers all over the world. The company kept growing year after year, and soon new premises and high tech equipment were acquired. The company also started manufacturing quite a lot of other products like pens, toys, games and stationery. With the help of the newly acquired presses, in 1879 the company launched a range of almanacs, greeting cards and calendars. 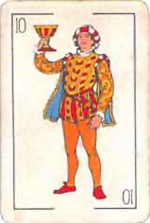 To make playing cards available to all sections of the society, Goodall established the London Playing Card Co to manufacture lower range cards. The company was known for their special Jokers and Aces which were often used by them for advertisements. In 1898, Goodall & Sons became a limited company. With the onset of the World War I, business soon deteriorated and eventually in 1922 the company was merged with their competition, De La Rue. Till 1929, the Camden Works kept running and their brand names were still used for many years later. The Ramesses fortune telling cards that were manufactured by Goodall & Son were sold in a snakeskin box. The back design included various Egyptian scenes and pictures. Their first double-ended designed cards were introduced in 1860. Because of their beautiful designs and their innovative ideas, the designs of the Goodall cards have been widely adopted by several manufacturers from all over the World. For almost a decade, Charles Goodall & Sons Co remained one of the most important cards manufacturers in England and was responsible for the court card designs that are today seen in most of the modern day decks.